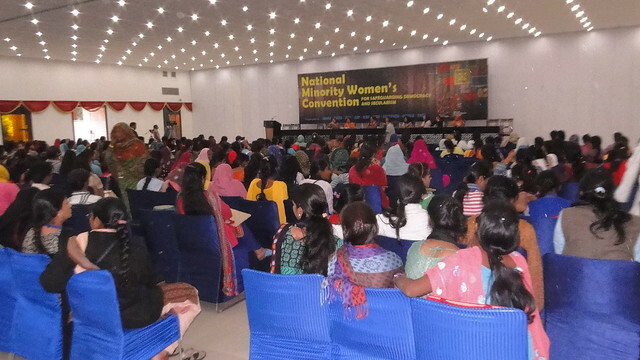 New Delhi: A national minority women’s convention was held in the Constitution Club’s Annexe hall in the national capital which was presided over by various organizations working for democracy and secularism. It was participated by minority women from all over the country who shared their stories of getting targeted in different communal tensions at different times. “We have gathered here to let the communal forces know that the minority women of India will not let a fascist and a misogynist Narendra Modi become the Prime Minister of India. We have to stop the advancement of communalism at all cost,” said Shabnam Hashmi, the convener of Act Now for Harmony and Democracy (ANHAD). 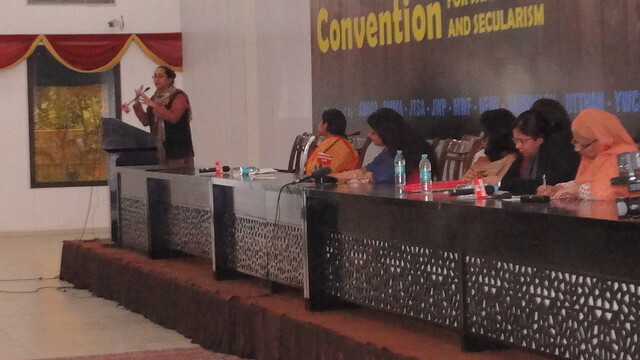 The convention which kicked off at 9:30 am was split between three interactive sessions. The first session saw the victims and eye-witnesses of Gujarat, Muzaffarnagar riots and Dhule shootings telling their tales of horror to the jam-packed hall of attendees and media persons. Bilkis Bano, Sultana Sheikh from Gujarat, Musarrat Jahan (Ishrat Jahan‘s sister) from Mumbai, Madina from Dhule. Mufia from Gopalgarh, Sobhamani Karkaria from Kandhamal and Tahirun Khatoon from Forbesganj were also present at the convention. The second session was held at 2:30 pm which was titled ‘Breaking the stereotypes,’ in which noted speakers and women activists, journalists and film makers like Albeena Shakeel, Arfa Khanum, Meera Rizvi, Saba Azad, filmmaker Samina Mishra and Seema Siddiqui participated. “At the time when I joined journalism, women were very few and despite my advanced qualifications I was still expected to work in Urdu journalism only because of the stereotypical tag of Muslim woman I was carrying and I tried equally hard not to be thrown into Urdu services,” said Rajya Sabha TV anchor Arfa Khanam with a smile while addressing the gathering.